HONOLULU -- The Solar System is about to look a lot more crowded. A group of telescopes using the world's biggest digital cameras will soon start scanning the sky from the Hawaiian Islands, tracking down thousands of the smaller, dimmer and overlooked objects in the Sun's neighborhood. The reason? Hunting for those dangerous space rocks that still elude detection. When fully operational, the Panoramic Survey Telescope and Rapid Response System (Pan-STARRS) project will deeply scan most of the night sky several times a month. About three-quarters of the sky are visible from the Hawaiian Islands, and Pan-STARRS will use four linked telescopes connected to its enormous cameras to take broad pictures of unprecedented detail. Objects as dim as 24th magnitude--250 times fainter than objects detected by the current champ in asteroid spotting LINEAR--will pop out of the background and be analyzed for their threat potential. In January of 2006 the first of the four will see first light, looking forward to when the entire system is operational in 2009. Pan-STARRS will bolster the Earth's early warning system for threats from asteroids and comets--a congressionally directed program that currently consists of LINEAR (Lincoln Near-Earth Asteroid Research), LONEOS (Lowell Observatory Near Earth Object Search), NEAT (Near Earth Asteroid Tracking) and Spacewatch. Dr. Nick Kaiser of the University of Hawaii's Institute for Astronomy (IfA) is chief scientist on the project, and has taken it in a slightly different direction that first envisioned. 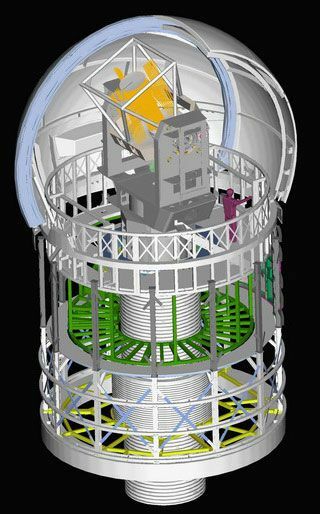 "(The National Academy of Sciences) had in mind a single ~6m (about 18 ft.) telescope but we had been playing around with the idea of doing this with a cluster of smaller telescopes, for reasons of cost and speed of construction, and thought that these had a competitive advantage," says Kaiser. Instead, Pan-STARRS will use a collection of four 1.8m (about five ft.) telescopes, set to take wide images and linked via computer to yield a final image as detailed as if a single 3.6m (about 12 ft.) telescope were used. As the first telescope in the array, named PS1, nears completion, work continues on the four revolutionary cameras that will make the work possible. Digital cameras, which use no film and send their data directly to a computer for analysis, have been the standard for professional astronomy for years. But the ability to quickly scan large swaths of the sky for the faint lights of possible threats is beyond any current models. The new units have to be bigger, better, faster and cheaper. And Kaiser says they will be. "The goal that we set was to build cameras with 10 times as many pixels, that could be read out 10 times as fast (to enable us to rapidly scan the sky), and for one tenth the current cost per pixel! Amazingly, the IfA detector group (along with MIT's Lincoln Laboratory) are rapidly closing in on this goal," he said. "The cameras will each have 1.4 billion pixels and will be read out in a few seconds as the telescope slews to a new target." Photographed through the unusually wide-angled telescopes, each 30-60 second exposure will take up about 2 Gigabytes of data, and take about a minute for the computers to process. At this rate, Pan-STARRS will be collecting about 10 Terabytes of data each night. "There has been rapid evolution in wide field (digital cameras) in the last decade or so," Kaiser explained, "with major contributions from the Hawaii detector group, and many people realized that the time was right for a major leap forward." When these "wide screen" high-definition images finally start rolling in, turning the trickle of new potential dangers into a torrent, it could easily overwhelm the established system for handling them. "The current mode of operations for asteroid/NEO searches is for the various observing projects (and amateurs) to send their detections to the Minor Planet Center ... (which) acts as a clearing house and they determine orbits for the objects and make these available to the general community," said Kaiser. "A problem with this model for Pan-STARRS is that our rate of detections will be much higher and would swamp the current system." Kaiser says they plan on handling most of the analysis of orbits themselves. But it's all part of how hunting for these dangerous objects have changed in recent years, as more sensitive instruments come online, and public awareness (and occasional paranoia) grows. "What happens is that every so often an object is detected that has a small, but not vanishingly small, chance of hitting the earth some time in the future," Kaiser explained. But one observation is never enough to rule out danger, and it takes the work of observers across the globe to nail down a new object's path -- a process that can hardly be done in secret. "While it may seem confusing to the public," Kaiser explained, "that discoveries of potentially hazardous asteroids are announced and then fairly rapidly declared to be non-hazardous, this is in fact inevitable."